The Thor is the best-in-class vehicle mount computer by Honeywell. 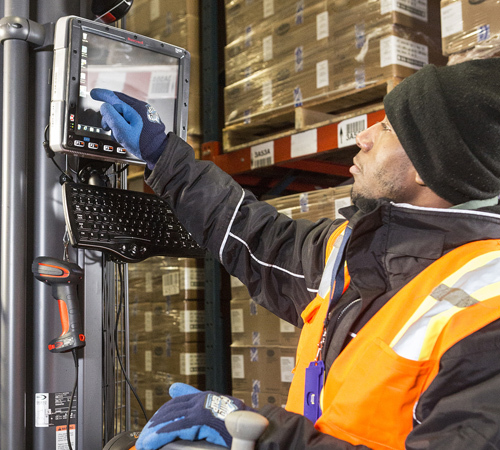 Our customers love the Thor because it is rugged and able to withstand jostling from the forklift. It’s rated to -22 degrees, so it works great in the freezer. The Thor is a great alternative to a handheld computer because it is mounted right to the vehicle and has a large screen for easy viewing. You can attach a corded or cordless scanner. There are three Thor options: the VM1 has a touchscreen and a full physical keyboard, and the VM2 and new VM3 have a touchscreen without a keyboard and a larger viewing area (the keyboard is touch). The VM2 has a 10" screen, and the VM3 has a 12" screen. View the VM1 Specifications, VM2 Specifications, and VM3 Specifications. The Thor replaces the VX computers by LXE, including the VX3, VX6, and VX7. These units are end-of-life. The last date of service for contracts is June 30, 2015. Field-replaceable front panel that let you quickly swap out the touch screen, keyboard, and defroster — without sending it in for service. Quick-mount dock for moving the units from one forklift to another. You don’t need a unit for every forklift — just the ones in use! Ignition control keeps your vehicle battery alive by switching to a low power setting when not in use.